Each year people toss out billions of dollars in food waste. FoPo’s vision is to reduce food waste by extending the shelf life of food about to expire. Government agencies and politicians who create and enforce fishing policies such as Department of Commerce, Department of Transportation, National Oceanic and Atmospheric Administration, Environmental Protection Agency, etc. All received trash will be weighed and associated with a unique waste disposal ID, which includes name, location, type of business (if applicable), and will track trash disposal patterns. New Yorkers must create a personal profile ID and PIN No. Garbage trucks will only pick-up trash from the collection center. Recyclable and refuse waste days remain. Trash will be collected on a timely schedule and adjusted based on demand. – hospital staff: doctors, nurses, technicians, management, etc. One-man operated truck that fills, flattens, and seals potholes in 30-90 seconds per pothole. 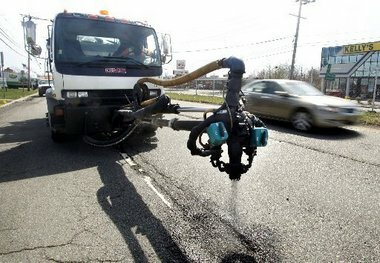 The operator points the patchers delivery nozzle at the pothole and sprays a mixture of asphalt emulsion and stone to fill the pothole which is then topped off by a barrier coating of material to prevent tracking while the repair sets up. Issue: Thermostats control half of a residential home’s energy bill. They are often set to one temperature regardless of whether or not anyone is home. If the thermostats can be adjusted for when a house is empty, each household can reduce 20% of their total energy costs. Use a proven smart technology thermostat such as Nest, which learns each household’s room temperature preferences and automatically adjusts itself after a week. The Nest thermostat has a motion detector and will turn off the AC or heat when there is no one home. Nest calculates how long each home takes to heat or cool and begins heating or cooling a home before there are people home. This discourages families from setting extreme temperatures such as 55°F when they actually wanted it to be 70 °F. People mistakenly assume that a home will reach 70 °F faster if the thermostat was set at 55°F. An article in Green Building Advisor compiled studies on the Nest technology. In two separate states, Oregon and Indiana, the Nest technology has been proven to provide cost savings. Buy and Install Nest Thermostat, can choose to self-install or pay for a professional. Manually adjust Nest Thermostat for the first two weeks. Nest Thermostat will learn the household’s room temperature preferences. Track monthly energy usage through Nest’s energy report.